OH! Emerald Hill Art Tours, Openhouse.org, Singapore, 3 to 25 March, 2018. Agnes, was a second-generation Singapore born Armenian. She was the oldest daughter of Urelia Joaquim, born in Singapore and the granddaughter of Isaiah Zechariah, one of the founders of the Church of St. Gregory the Illuminator – we know it as the Armenian Church of Singapore. Agnes was intelligent, artistic, devoted to the church, her family and her garden. Agnes chose not to marry even though she was quite a beauty. While her brothers were sent to expensive boarding schools and universities in the UK, it was expected of a good girl to instead help her mother care for her eleven siblings. In Mount Narcis, the family house in Tanjong Pagar, named after her older brother Narcis, Agnes grew all manner of flowers, fruits, herbs and spices. Both her parents and brother Joe shared a passion for horticulture. Parsick was on the committee of the Agri-Horticultural Gardens and the board of Singapore Botanic Gardens. Her mother and brother both won numerous prizes at the Annual Flower Shows, but none were as successful as Agnes who is credited with winning over 70 awards, despite her lack of formal training. At some point in the late 1880’s or early 1890’s Agnes began experimenting with hybridizing orchids, specifically Vanda Hookeriana, which grows in the sunny, marshy areas of Malaysia (also known as “Kinta Weed”) and Vanda Teres, which is Burmese. Her efforts led to many trials and failures until 1893 when her attempt to cross the two orchids succeeded - it had bloomed - resulting in a beautiful new orchid. She showed the orchid to Henry Ridley, a world orchid expert and director of the Singapore Botanic Gardens. In fact, rare orchids were highly prized by collectors in the 19th Century and there is a story that a Vanda Miss Joaquim was taken to Britain and sold to a member of the Rothschild family for the princely sum of 500 guineas (about $1000). Ridley examined it, pressed a cutting, named and recorded it “Vanda Miss Joaquim” after Agnes, in the Singapore Botanic Gardens herbarium, in April of 1893. He then sent an article to the respected British horticultural journal “The Gardeners’ Chronicle” who published it in June 1893. It stated “A few years ago, Miss Joaquim, a lady residing in Singapore, well-known for her success as a horticulturist succeeded in crossing Vanda Hookeriana… and Vanda teres…” He further said “..I cannot find any record of this cross having been made before…”, and went on to describe the new orchid. Britain, the Vanda Miss Joaquim cutting grew and blossomed. In 1897, it made its debut at the Royal Horticultural Society Flower Show, where it’s inflorescence of 3 full flowers and 9 buds, so impressed the judges that it won a First-Class Certificate (A gold medal in the world of horticulture). Sadly, 3 months later in July 1899, Agnes died of thyroid cancer and exhaustion due to pneumonia, only 44 years old. For years her legacy lived on as scientists in Britain, America and Asia recognized Agnes’s achievement. Vanda Miss Joaquim is credited with giving root to Hawaii’s commercial orchid industry. Today, Singapore is a recognised world class centre of hybridisation. Vanda Miss Joaquim led the way becoming the orchid in every flower shop. It travelled the world as a unique gift and ambassador for Singapore. At its height, it was the most commercially successful orchid in the world. By the 60’s a wide variety of orchids were being shipped globally from Singapore and in 1981 the Vanda Miss Joaquim was selected as the National Flower of Singapore, for its “vibrant colours, hardiness and resilience – qualities that reflect the Singapore spirit”, as well as its year round blooming quality. Once again Agnes made history. But now new narratives emerge. When Agnes hybrid orchid “Vanda Miss Joaquim” was selected as Singapore’s national flower, a local newspaper featured an article complaining that another orchid should have won the honour, arguing that the other flower was created by “a true Son of the Soil” (a local Chinese lawyer, businessman). Yes, Agnes Joaquim was a women with foreign ancestors (like 99.99% of Singaporeans). But, she was born in Singapore. Her Mother was born in Singapore. Agnes spent her whole life in Singapore working away in her garden, growing treasures out of the lush Singapore soil until she passed away to be buried in the Bukit Timah cemetery. Was she not a true daughter to the Soil? Second insult came from the negative meaning of “soiling one’s name” and from the fact the even as late as 2002, some experts argued that Agnes did not breed the national flower, she “merely discovered it, loitering about in her garden” despite evidence that she spent years of trial and errors to make the cross and all the official records confirms this. The main argument against her? The she could not have achieved such a feat, because she was a women! Until 2015, when she was inducted into the Singapore Women’s Hall of Fame, by President Yacob Halimah, then speaker of the house, taking her rightful place in the history of Singapore’s pioneering women. In September of 2016, The Straits times ran a full-page story, officially accepting Agnes Joaquim as the creator and cross-breeder of the Vanda Miss Joaquim, our National Flower. While Agnes is believed to be the first woman in the world to create a hybrid orchid, a daughter of our soil, most Singaporeans have never heard her story. Materials: Sound, fragrance, vintage objects, vintage lace, soil, gold wax, metal, nylon, wood, dried flowers. Keywords: Colonial feminism, Botanical heritage, The Story behind Singapore as a garden city, the National Flower, a National Icon, the Forgotten Heroine. All together, the three layers of the sculptural piece form the obstacle (crinoline cage), action (hard work, connected to nature) and result (a blooming garden, ending with the national flower). First layer- Crinoline - symbol of “the cage” of the 19th women - no (or highly limited) access to education, work, travel and politic. (Obstacle). Crinoline: what the 19th century women used to wear underneath their dresses. Symbol of a “cage” as these women were kept away from public speaking, higher education, business, war and politics. Exposed and left open as Agnes manages to break free of her cage. Second layer: the Lace: symbol of “women’s work”. Hard work. In Soil: nature and rootedness. (Action). Through hard work and connection with nature, Agnes made her success. The lace are all handmade and originally from Europe. 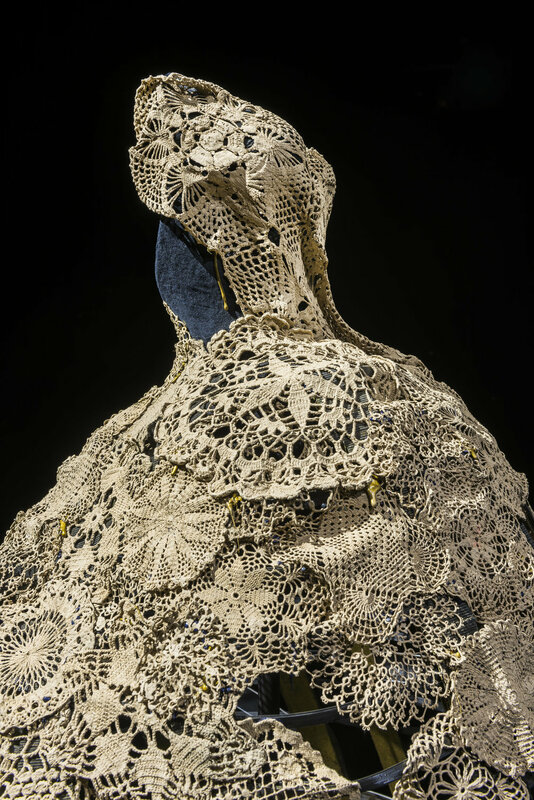 It is estimated the experienced women creating this lacework have spent more than 2,000 hours doing so. As lace work and other crafts would only be a couple of hours a day, this equals to about 3 years of daily work! It is believed that it took Agnes up to 13 years to cross-breed her orchid. 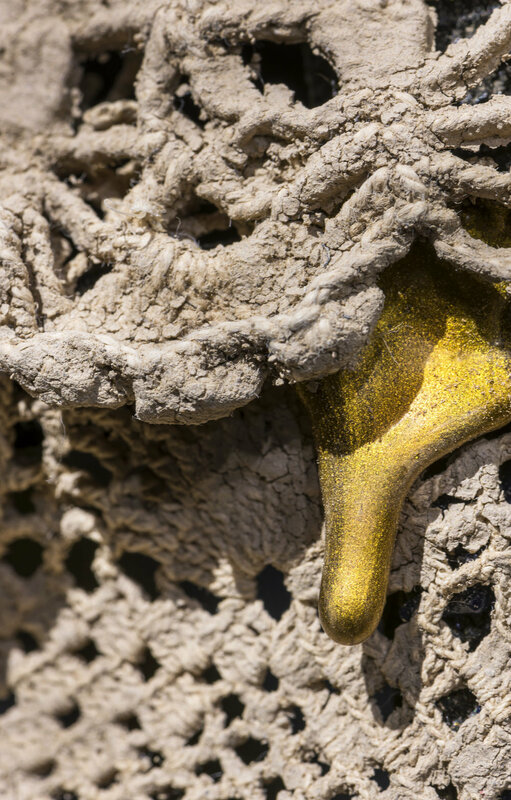 The lace work has been “soiled” directly in soil taken from the original garden of Ms Joaquim, soaked in it for 24 hours and dried under the hot Singapore sun. 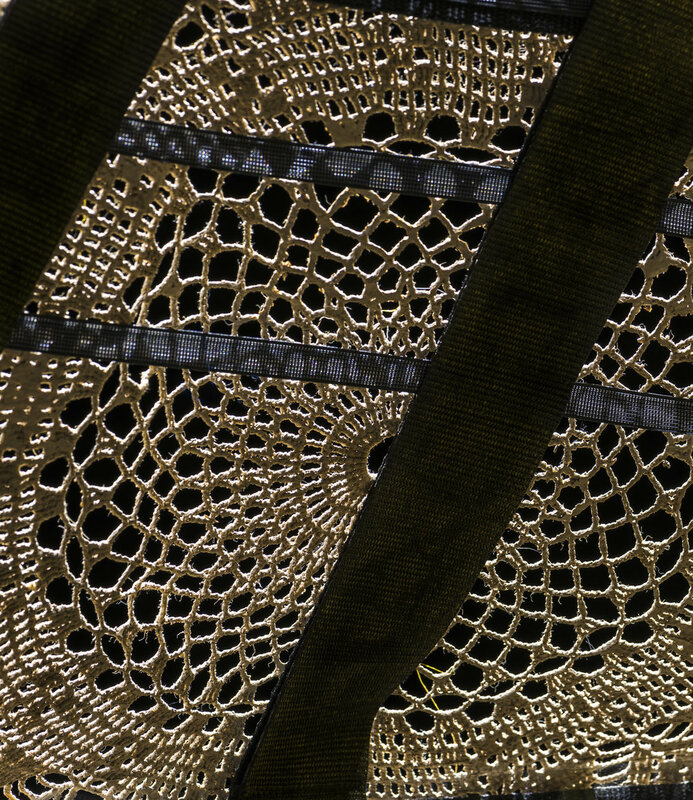 The lace is applied with Golden Wax: Agnes’s family was a wealthy family, thus her circumstances were more fortunate, compared to most other women born in Singapore during the 19th century. Third layer: Flowers on the floor piece: symbol of the botanical treasures that Agnes manages to grow by her hand (Result). The flowera trail: her legacy. The different kinds of flowers (many foraged around Singapore) forming an abstract visual of the national flower, blooming at the end. The flowers used are chrysanthemums, roses and orchids (for which Agnes won many awards during 1880s and 1890s). Also, recently foraged flowers around the Armenian Church area of singapore(Armenian street and Hill street), where Agnes spent considerable time and where she was christened and ultimately had her funeral. Poem written by artist in the honour of Agnes Joaquim, a representative of historical woman overlooked and forgotten in the popular memory of colonial Singapore, as opposed to the “white man” narrative. Their heart forever will prosper and bloom. (Written by Mamakan in St. Andrews Church, Singapore, February 2018 and recited in the Armenian Church of Singapore). The soundscape is a new composition by Mamakan and Gunnery and flows with a hybrid of rainforest garden sounds (Singapore) and the Armenian Duduk instrument (Agnes Joaquim's ancestors, roots) overlayere with the voices of 27 women. The women reciting the poem rages from a 4 years old girl to 94 years old (Ms Hazel Locke, the grandniece of Agnes Joaquim). Some are local, some are foreign, making it a hybrid of nationhoods. All the women are standing up for other women overlooked by history. The soft and graceful sound of women’s voices symbolises solidarity and pride of a very skilled, innovative and pioneering sister. These recordings - representing womanhood in today’s Singapore - is signifying our support of a timely re-look at our history to uncover more stories of the forgotten heroes and heroines. 1. Perfume in small vintage bottle. “Daughter of the Soil” Perfume, Sensorial experience of her garden and its treasures. Plants and Flowers that Agnes Joaquim grew in her garden in Tanjong Pagar in the 1880s and 1890s, as well as native botanicals foraged around the Armenian Church during February, 2018. At the artist’s home, the foraged botanicals were infused in grape seed oil for 2 1/2 days according to the 2000 year old Armenian Holy Muron tradition while playing the “Daughter of the Soil” poem and the final perfume was sealed on February 15 during the solar eclipse said to contain “illumination” by mystic belief. Jasmine, Rose, Lime, Black Pepper, Myrrh, Orange, Frankincense, Vetiver, Ginger Roots, Pandan Leaf, Kaffir Lime, Turmeric, Torch Ginger Flower, White Ginger Flower, Shampoo Ginger Flower, Betel Nut, Nutmeg Mace, Laksa Leaf, Lemongrass, Ylang Ylang, Grape Seed Oil, Coconut Oil. 2. Dark perfume bottle (owned by Miss Linda Locke, great grandniece of Agnes Joaquim): oil infused of native botanicals of Singapore, the foraged “base” of the Perfume above. Rootedness and belonging. Smells like food, the one passion that unites Singaporeans. 3. Crystal vase with apricots; the national fruit of Armenia, the country of many of Agnes Joaquim’s ancestors. She never experienced it, but must have heard many stories if the “land of the apricot”. Interestingly, the “Vanda Miss Joaquim” is yellow and orange at its inner core. 4. Tall red glass stand: Small pieces of ceramics found when the artist was digging up the soil in the place of the original garden of Miss Agnes Joaquim, Tanjong Pagar, Singapore. 5. Round oval glass cube with “Vanda Miss Joaquim”, the National Flower of Singapore in 24 carats of Gold, courtesy of RISIS. 6. Little date stand in Marble; from the artist’s great grandfathers desk, probably from 1890’s. The date 15 April (1981) was the day that “Vanda Miss Joaquim” was selected as the national flower of Singapore. 7. Small golden frame (artist’s family heirloom): the ONE and only photo existing of Agnes Joaquim. Displayed with the permission of Agnes Joaquim’s family. 8. Larger golden frame (artist’s family heirloom): reproduction of the list of awards won by Agnes - 68 in total - at the annual singapore flower show. She won the most prizes in her family, and possible in Singapore. Notice how the prizes are starting with fruits and veggies - often difficult ones like cucumber and melons - over to flowers and artistic arrangements ... and ending up winning with the presentation of “Vanda Miss Joaquim” in 1899, winning the grand prize of the ‘rarest’ orchid. This was her final moment of glory and she died three months after of cancer and exhaustion from pneumonia. Her tombstone is inscribe with the following; “let her own works praise her”. 9. Crystal Glass bottle with white sherry and ONE Small Crystal glass; despite being beautiful, wealthy and intelligent, Agnes choose never to marry (see one glass) and concentrate on her horticultural career. Sherry was typically what a Victorian lady would drink, a “ladies” drink when men would instead choose drinks like whiskey and cognac. 10. Hat, Gloves, flowers and shovel: Symbolic of a women who was not afraid of hard work and of getting her “hands dirty” in the garden. 11. Little needle pad and lace creating in process with a finger cap in silver and emerald: (from the artist’s Great Grandmother born in the 19th century and a very skilled seamstress) by mostly being confined to her home, a 19th century lady was often very active in handcrafts like lace and embroidery making. Agnes made a beautiful altar cloth for the Armenian Church, admired for many years, but unfortunately donated to a confused nephew who created it together with his wife according to the Joaquim family legend. 12. Silver hairbrush with real hairs: inherited by the Great Grandmother of the artist as a confirmation present. Symbol of beauty.